Welcome to my review of the Celestron SkyMaster 15×70 Binoculars. Celestron is well known for its optics, and a pair of binoculars designed for stargazing was especially interesting to me. After all, I love stargazing, but it can sometimes be too much trouble to lug out my telescope and set it up, especially when I just want to spend a little bit of time looking at the night skies. How well do the SkyMaster binoculars meet up to the Celestron name, though? Let’s find out! The Celestron SkyMaster 15×70 Binoculars features 70mm objective lenses, in a porro prism configuration. The magnification is a powerful 15X, which makes the binoculars superb for amateur astronomy. The magnified image is crisp and clear, with plenty of contrast. Unfortunately, there is some chromatic aberration, which leads to a red halo around particularly bright planets. Celestron has used a porro prism design with the SkyMaster 15×70 Binocoular. The optics are multi-coated for sharp, clear views, but they are not fully multi-coated. This means only one surface of the lenses have been multi-coated, instead of all air-to-glass surfaces. Even so, the twilight factor on these bins is quite good at 32.40, with a 22.09 relative brightness. The prism glass is BaK–4, which I would totally expect out of a pair of binoculars designed for night use. Eye relief is a very comfortable 18mm, which makes the bins easy to use even when wearing eyeglasses. The linear field of view for these binoculars is an excellent 231 feet at 1,000 yards, making the binoculars useful for either terrestrial or astronomical viewing. Here’s the serious drawback of the Celestron SkyMaster 15×70 Binoculars: quality control. The first pair I received was out of collimation, and I had to return them for a replacement. A friend of mine who teaches astronomy purchased 10 pairs of these binoculars, and 4 of the batch he received were out of collimation and had to be returned. This is frustrating, particularly because it is easily fixed on the manufacturer’s end by doing a bit of quality control to ensure all shipped binoculars are fully collimated. What’s the Body Like On These Binoculars? The body on the Celestron SkyMaster 15×70 Binoculars is built with a protective rubber covering for a terrific grip. The stippling on the handholds is very nice and comfortable, and the SkyMaster binoculars are easy to keep a hold on, even if you have sweaty hands or are wearing gloves. The large center focus knob is easy to spin, but it tends to drift a bit even after focusing, so you have to spend almost constant attention on keeping your target crisp and clear. Celestron has designed the SkyMaster 15×70 binoculars to be compatible with a tripod adapter, and includes one in the package. My recommendation is to go ahead and buy a metal tripod adapter, because the plastic adapter that comes with the binoculars wobbles constantly. This completely defeats the intended purpose of using the tripod, stargazing or planet-gazing, since you can’t keep your image properly in view. The protective rubber armor on the Celestron SkyMaster 15×70 Binoculars not only makes the bins easy to grip, but provides excellent protection against bumps and falls, too. My pair haven’t suffered any serious falls, but they have continued to work perfectly even after a couple of short drops. 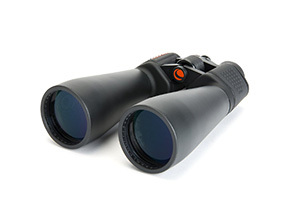 The Celestron SkyMaster 15×70 Binoculars feature O-ring sealed lenses for water resistance, and the optics chambers are nitrogen-filled to prevent fogging. The Celestron SkyMaster 15x70 Binoculars are very well-suited to amateur astronomy, as long as you receive a pair that are properly calibrated. Unfortunately, if you hold the only natural expectation of getting a decent product the first time around instead of after a return-exchange transaction, you should probably pass on this model.